I’ve broken up the crazy end-of-the-semester season by sneaking in episodes of The Magicians, the SyFy series based on Lev Grossman’s novels. The premise of the novels and TV adaptation blends Harry Potter, The Chronicles of Narnia, The Paper Chase, and a host of generic 90s shows about good-looking 20-somethings to imagine a grad school for magicians. It took a few episodes for the show to click for me (I can pinpoint the exact moment in the fourth episode of the first season), and now I’m enjoying it immensely. It’s the closest thing to Buffy in tone that I’ve seen in years. But it’s also a critique of Buffy’s optimism (or was it Joss Whedon’s optimism?). Things in The Magicians keep breaking. Every solution to the show’s major crises spawns further crises. There is never any resolution, a vivid illustration of what philosophers call a “wicked problem”—a problem so complex and intractable that there’s no way to test for solutions or even know when you’ve stumbled upon the least bad solution of the many bad solutions. “Why can’t anything just be fixed,” wonders Kady in the season 2 finale. And that’s pretty much the overarching theme of The Magicians: nothing can ever just be fixed. I’ve been thinking lately about one narrative invention in The Magicians magical universe, the idea of the shade. A shade is that part of a person that imbues them with emotions and empathy. In secular terms it’s a bit like a conscience. In religious terms, a soul might be the analog. Shades can be removed—either by force or by choice—and the result is a human who resembles what we might commonly call a sociopath. The Big Bad in season one of The Magicians removed his shade by choice, rendering him unswayable by pity, untouched by regret, and immune to shame or guilt. In season two Julia is another character who loses her shade. It’s accidental, a metaphysical mishap that occurs during the magical equivalent of an abortion after she’s been brutally raped by a god. Losing her shade makes it impossible for Julia to empathize with others on anything but an intellectual level. Unlike the Big Bad, Julia is a fundamentally good person. She knows she’s supposed to empathize with others, so she tries, without much success, to fake it. Losing her shade also makes it possible for Julia to deal with—ignore is probably a better word—her own post-traumatic stress. She can’t even empathize with herself, in other words. Instrumentality: The objectifier treats the object as a tool of his or her purposes. Denial of autonomy: The objectifier treats the object as lacking in autonomy and self-determination. Inertness: The objectifier treats the object as lacking in agency, and perhaps also in activity. Fungibility: The objectifier treats the object as interchangeable (a) with other objects of the same type, and/or (b) with objects of other types. Violability: The objectifier treats the object as lacking in boundary­ integrity, as something that it is permissible to break up, smash, break into. Ownership: The objectifier treats the object as something that is owned by another, can be bought or sold, etc. At some point Julia asks her frenemy Kady to act as a kind of external shade, a moral compass to tell Julia when she’s going too far. It’s an interest objectification twist, as Julia instrumentalizes Kady but in a way that acknowledges Kady possesses a subjectivity that surpasses Julia’s own experiences and feelings. For me at least, it matters because I’ve begun to pay close attention to the way American society—whose economic and cultural might was made by possible by enslaved people who were literally and legally considered objects—I’ve begun to pay close attention to the way American society objectifies others. Objectification—treating people like things that have no autonomy, no interiority, no subjectivity—is happening, at all levels of our government and national discourse, right now. 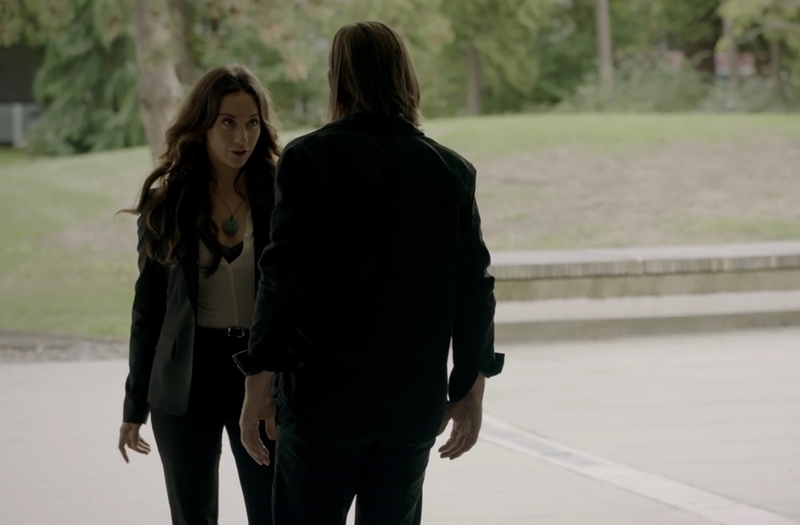 The Magicians offers a metaphysical explanation for why objectification happens. The objectifier has lost their shade, that “tiny beating heart” at the center of one’s being, as the Big Bad explains to Julia. A shade—or lack thereof—is the fantasy equivalent of what we often see in science fiction, where technology is the reason for someone’s increasing emotional disconnection to others. In Richard K. Morgan’s Altered Carbon (2002), for example, there are some humans who have lived so long through cloning and the digital transfer of their consciousness into new bodies that they become “Meths”—or Methuselahs, centuries-old humans who view mortal humans as their playthings. Looking to fantasy and science fiction for explanations of objectification might, might, give us some insight for understanding how objectification happens in the real world. I’m not saying Donald Trump lost his shade, but I’m not not saying that. Seriously, though, fantasy and science fiction can also expand our imaginative possibilities for overcoming objectification. Call it speculative humanization. Returning the humanity of objectified people. Julie turns to her support network to help her. Science fiction offers examples too, like Lauren Olamina’s hyperempathy in Octavia Butler’s The Parable of the Sower (1993). Lauren is born with hyperempathy, a neurological side-effect of her mother’s drug addiction, which causes Lauren to experience the pain (and pleasure) of others. Hyperempathy makes it nearly impossible for Lauren to cause suffering in others, unless she wants to suffer herself. What other theories of objectification do fantasy and science fiction offer? And what other paths toward reinstating empathy do fantasy and science fiction offer? How do we lose our humanity, how do we regain it, and how do we stop treating people as things? These are the essential questions for our times.